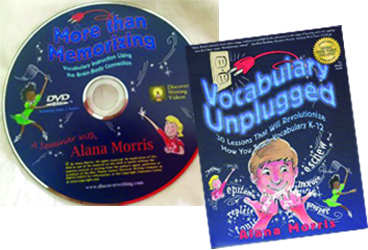 MORE THAN MEMORIZING includes a copy of Vocabulary Unplugged, Ms. Morris’ outstanding best-selling professional book, which explains and utilizes the research basis for vocabulary study and teaching. Master teacher Alana Morris illustrates how to teach vocabulary using multiple learning styles in ways that engage students of all grade levels. Taped during a workshop before a live audience in Dallas, Alana will show you how to make words come alive in the minds of your students. Your students will begin to own their new words, rather than just memorizing them for a test. Ms. Morris has taught all levels of both elementary and secondary students and is currently a district-based language arts program director in the state of Texas. She is also president of C.R.E.S.T., the Coalition of Reading and English Supervisors of Texas.